You could say she understands and practices sales at a molecular level. Lauren Wadsworth (@L_Wads_) studied molecular biology in school, did research on termites for four years and has been published in a scientific journal. So how did she end up making the transition from science to sales? It all comes down to people. After being hired as the eight SDR on a team that now boasts more than 45 people, Lauren has witnessed explosive growth first-hand and even went viral on LinkedIn recently. But as a manager of global sales and development for Dynamic Signal, Lauren’s biggest motivator is helping her company succeed. Somewhat of a company news app, Lauren describes Dynamic Signal as being kind of like the New York Times for company information on your phone. 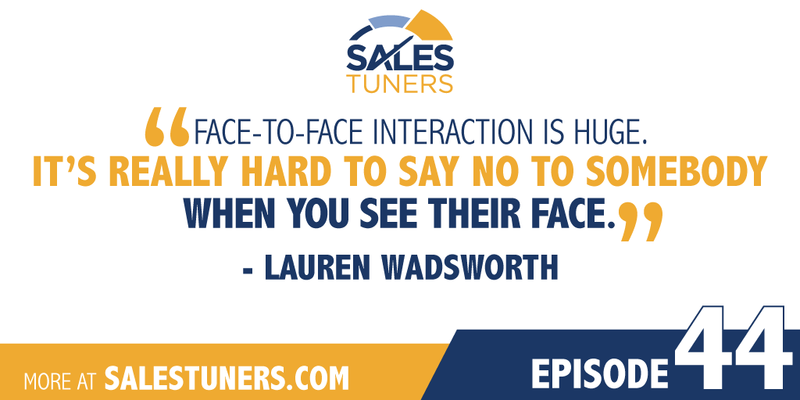 Yet Lauren will be the first to say getting and staying connected reaches even farther than the latest Smartphone when it comes to prospecting. It’s about more than getting down to business. It’s about getting personal. It’s about having real conversations with people face-to-face, whether that happens at conferences or in a personalized video. It’s about winning, but also about seeing losing as an opportunity for future growth. And most importantly, it’s about people. Make Planned Calls, Not Random Calls: For many people it doesn’t take long to realize that quality over quantity matters. For example, sometimes it’s not about how many calls you make. It’s about making planned calls that target specific prospects. Instead of working your way through a list and starting over at the beginning, make calls to the same two or three prospects in the same account on the same day. It’s Hard to Say No to Someone Personally: Face to face communication is huge and while you may not be able to personally meet all of your prospects at conferences, you can introduce yourself by video. It’s friendly and personal and offers you a different way to open up conversations. It’s really hard to say no to somebody when you see their face and they are more humanized. Ditch the Buzzwords and Generalities: Quit trying to make everything scale. Paul Graham wrote a great blog post all about intentionally doing things that don’t scale. When you try to stuff a script with all the features and benefits of your product while combining that with every possible use cases you solve, you end up appealing to no one. Try to bucket your prospects into groups of known challenges and then speak directly to them in the phrases they use to describe the problem needing solved.